Your goal is to refine the BitlyInteractive program into something reasonably attractive and easy to use. NOTE: I understand why you would want to work on a single project and keep updating it, but I want you to work one step at a time. I'm expecting to see three directories: Week06-BitlyQuery, Week06-BitlyInteractive, and Week07-BitlyRefine. Each folder should contain the proper code for their respective assignments. Right now we have several methods that have to do with displaying the fields of a link object. These don't really belong in the main object found in control.js. Let's move then into their own file called display. Don't forget to include the downloads module in the project. It was given to you in bitly interactive. More information is available below in the Create Table section. You will also want to clear the table so that the user can see the new data when you switch back and forth between local and cloud data. The call should be made just before you want to fill in the table with new data. This is a refactoring issue. We want to take a halfway step to fixing the global namespace problem. Let's begin by making sure all our objects begin with the letters elf. While you are doing the following, be sure you are running the unit tests. We are going to be changing variable names in multiple locations, and even when using Refactor in WebStorm, this can be complicated. As you make changes, run your unit tests and make sure they all pass. Also, check to make sure the interface works. The refactor option in WebStorm can help with this process, but it can also make changes that you are not expecting. I think the unit tests are more help than the refactor option, but you may have a different opinion. NOTE: Make changes one at a time. If you attempt to make too many changes at once, you won't know what is broken. Make a change, confirm that it works, then make the next change. We are not changing any file names, just the objects in the files. Changes to elfInput, including moving to its own file. Note that I have set the padding in the BODY tag to 10px rather than the default 50px that we get by default in Express projects. The elfDiv class ensures that the width of our panels is never larger than 800px, and that the panels are centered in the page. We center them by setting their margins to equivalent values: margin:auto. The scroller class is used to help us scroll the table that we put inside a panel, as described elsewhere in this document. 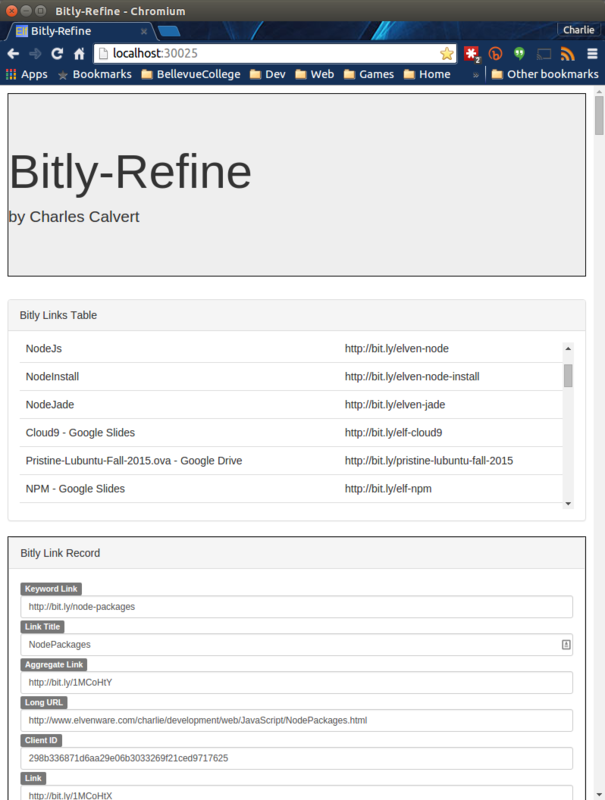 Our interface has a new section in it called Bitly Links Table. (See screen shot above.) Here are some hints on how to create it. // CALL THE showRecord METHOD OF elfDisplay HERE. element has an attribute called index that is set to the offset of that particular row in our bitly-links.json file. We can use that index to display the appropriate link object in our main form. All we need to do, is get ahold of the value of the index attribute for the row the user clicked. To do that, we use the jQuery attr property. Make sure you understand this code. It is important to understand how to work with attributes of your HTML elements. Here is the Jade that we use to hold our table. This jade and CSS scroller class found in styles.css ensure that our table has scroll bars and can be scrolled. NOTE: I've never tried it, but there is some chance that Midnight Commander might work on Cloud9. Perhaps you can use it to do directory comparisons. p by WHAT GOES HERE? There are many unit tests in $ELF_TEMPLATES/UnitTest/BitlyRefine. Copy them all into your spec folder and make sure they all pass. Run check-karma-grunt-config first as it helps you with the setup. Once it is all green, then run grunt fixture. Also, take a moment to look at spec/test-fixture-util.js. >  * Created by charlie on 11/9/15. Now the diff command should come back clean.